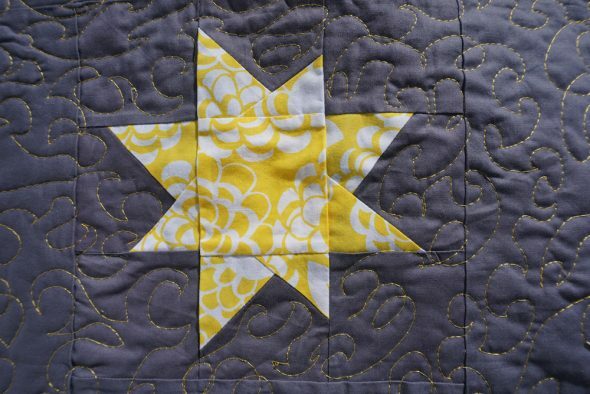 So this design features wonky 3″, 6″, and 9″ finished wonky star blocks. It’s 81″ x 81 finished, overall. All based on the relative sizes of Andromeda’s stars. 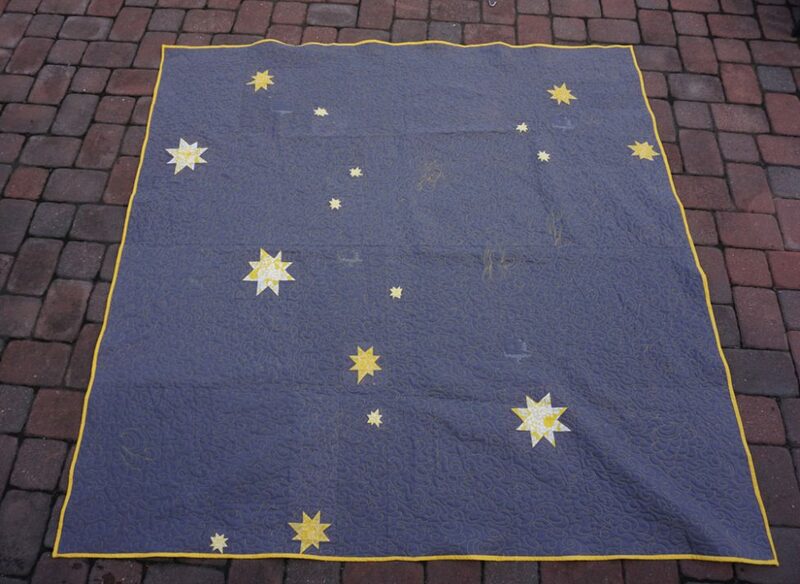 Originally I thought I might try and publish this quilt, so I haven’t posted much about this design before. But I kept picking it up and putting it down, never finishing, and wasn’t quite sure how I felt about it. I may write it up as a tutorial here at some point, but it became more of an experiment to try new techniques. 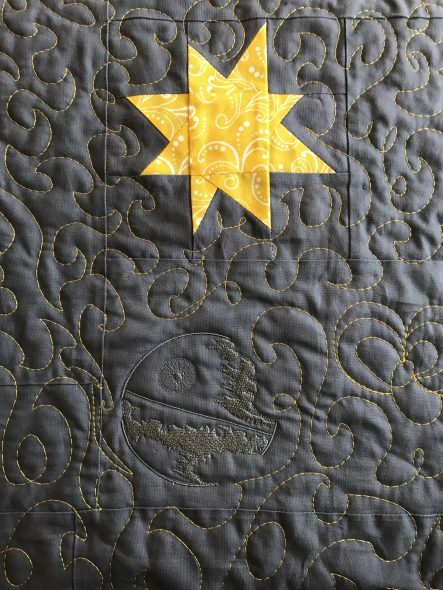 I used my embroidery machine to add some Death Stars throughout. 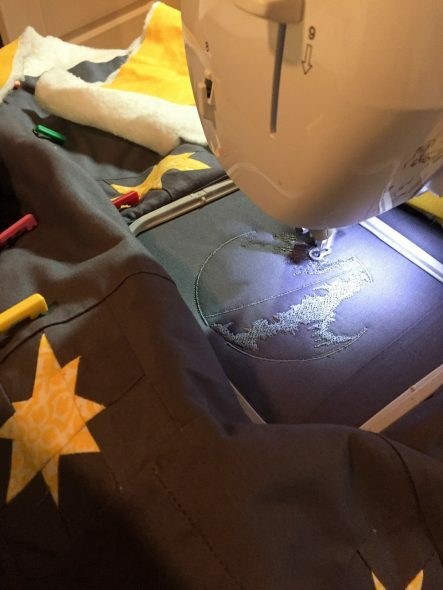 That was actually incredibly fun, adding some geeky embroidery to my quilting. Not all of the Death Stars came out perfectly, so it was a good learning process. I’ve figured out the limitations of my machine, and how much bulk it can handle. 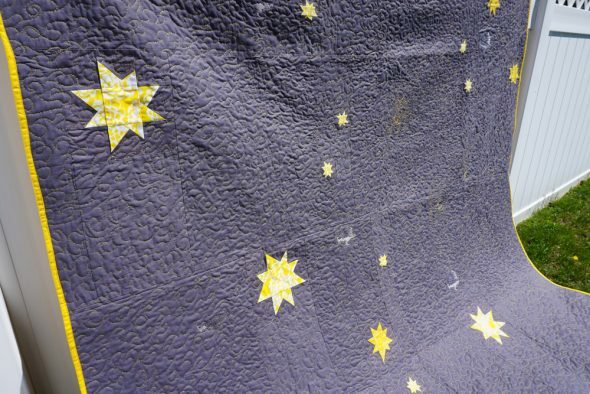 Death Stars on the right side of the quilt, with minimum extra fabric to feed through the machine’s throat, were far better than the ones I tried to push on the left side. 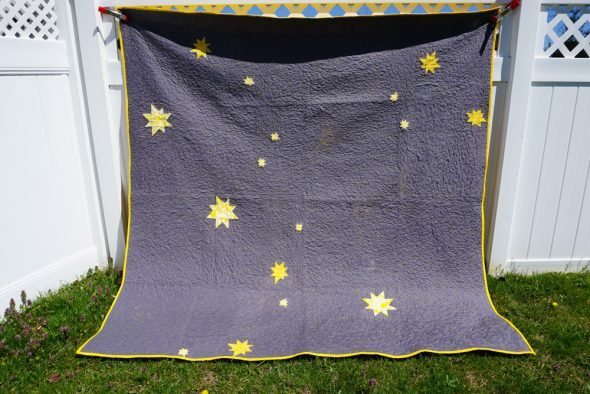 Because this design was directional, I had to stuff the bulk of the quilt through the small throat for those. That…did not work. 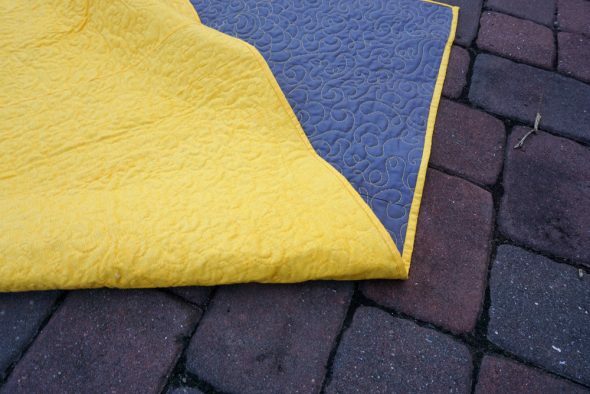 But the designs that did were really fun, especially once I quilted around them in yellow. I do love the gray and yellow color scheme. And it was kind of an interesting challenge to work with such an enormous negative space. But, I’m ready to go back to bold colors and rainbows for a while. This was the first project that I used my mom’s pin basting trick for (so I guess I did post about this one before). 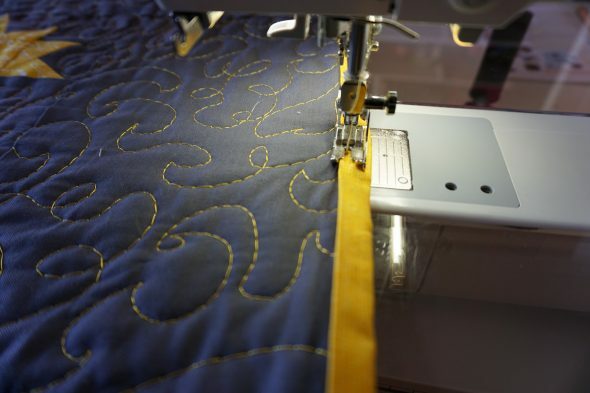 I also tried putting the binding on backwards, and machine stitching it down on the front of the quilt. My guild friend Karen was the one who turned me on to that method, I think. She’s full of clever ideas. Yeah, I love that I played with negative space and something unconventional here, but it was a lot of gray. And I’ve been living with it for too long. So I threw a very bright, single print backing on this to freshen it up a little. And now, time for something new.